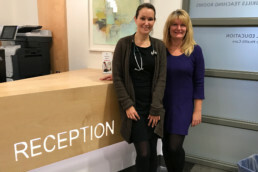 The St. Paul’s Maternity Care clinic is located in the clinical teaching area on the fifth floor of the Burrard building at St. Paul’s Hospital. We are affiliated with the UBC Family Medicine teaching program which gives us large, modern, state of the art clinic rooms and the privilege of helping to train the next generation of physicians. The doctors in our clinic will care for you throughout the prenatal and postpartum phases of your pregnancy. In the first two trimesters you will be seen monthly, then every two weeks between weeks 28-36, then every week in the last month. During this time, we will be helping you to prepare for your delivery and beyond. In the postpartum period, we will see you and your baby as needed in order to help with feeding and weight gain, as well as address any parental issues that may arise. Our clinic has established relationships with St. Paul’s pediatricians and obstetricians if either you or your baby need specialty care.